In the pursuit for small form factor, flexibility and functionality comes Seeeduino Mega – derived from Arduino Mega, it has all the features of the Arduino Mega, at a lower cost. Program it just like you would the Arduino Mega, and select "Arduino Mega (ATMega1280)" as the board type. 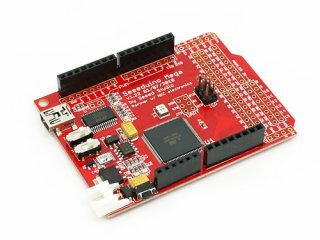 This board is compatible with most shields that work on the Arduino Uno and Duemilanove. This board comes assembled with the main headers soldered to the board. The "extra" Mega style headers which include the digital IO pins past 13, come in the package, and you will need to solder those to the board to use them (easy through hole soldering). This board comes with a free 6' USB 2. 0 cable! See this boards user guide here. Also check out our Arduino Kits. Kits include an Arduino board and the components you need to get started fast. Once you get your Arduino compatible board, see the project website for all of the specs and free development software.